The Two Destination Wedding Colors You Won´t Want to Miss this Year! Every year, the fashion and design industries eagerly await the release of Pantone´s “Color of the Year.” The chosen shade influences everything from high fashion to home décor, and most importantly to us, the Color of the Year also sets the tone for the upcoming season of wedding design! For the first time ever, the Pantone Color of the Year is actually two-in-one, and we are very excited about all the design possibilities of both Rose Quartz and Serenity (powder blue)! These colors are both calming and harmonious, and they are going to look fantastic in the soft light of any sunset by the beach. 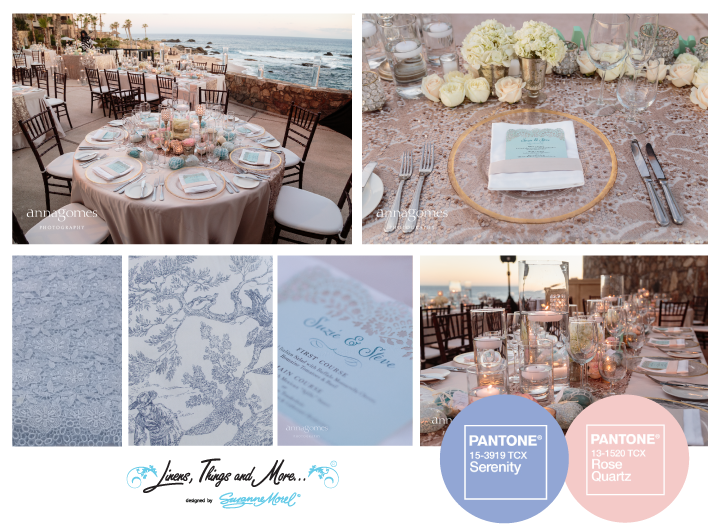 These pink and blue hues fill the sky here in Cabo almost every afternoon, and we can hardly wait to see the new combinations of florals, cakes and wedding attire these colors are sure to inspire here in paradise! At Linens, Things and More… we have some amazing collections that are going to look fantastic for a rose quartz or light blue wedding, and we are always working on new designs that perfectly suit our couples’ vision and personality! Contact us today so we can get started on your perfectly unique Cabo wedding décor and linens! This entry was posted in Accessories and decor, Cabo event design and decor, Cabo Floral Studio, Cabo Wedding planner and coordinator, Creative Destination Event Company, High end set-ups, Special Event Decor in Cabo, wedding locations in Los Cabos, Weddings and corporate events decor and tagged Cabo linen rental, CABO LINENS, cabo private party, Cabo table decor, cabo wedding, Cabo wedding design, Cabo wedding rentals, destination wedding Cabo, Event decor, high end wedding, Pantone blue and pink wedding, Pantone colors of the year, rose quartz wedding, Serenity blue wedding, Wedding design, wedding flowers, wedding napkins.